Home of Mannington Hardwood, Laminate and Mannington Waterproof Floors!!! 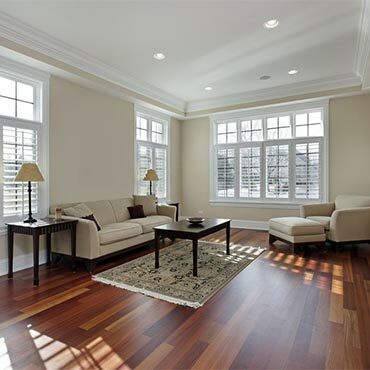 Engineered wood floors - Engineered hardwood is in fact produced with three to five layers of hardwood. Each layer is stacked in a cross-grain arrangement and glued together under heat and pressure. As a result, and engineered wood floor is less likely to be affected by humidity and can be installed on all floors of the home. The center core is usually a softer wood species and is used to construct the tongue and groove. A hardwood finish layer is bonded on top and another softer wood ply is bonded below the center. The top finish layer can be constructed of almost any wood specie, finish or color. Note: Please call before you visit,we may be out on a measure.After hours & evenings by appointment.